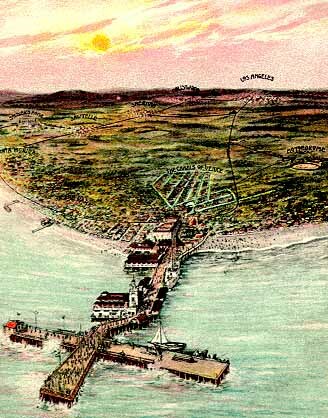 Once Abbot Kinney dissolved his partnership in the Ocean Park Improvement Company and acquired title to the undeveloped marshy southern part of the property in January 1904, it was time for Kinney to plan his new Venice of America beach resort. He was aware that the best examples of seaside resorts were on the East Coast. He also knew that the "City Beautiful Movement," that advocated planned communities with generous public spaces, was centered in the Boston area. He hired Frank Durham as his building superintendent and sent him east to visit various seaside resorts in New York and New Jersey. Durham made a side trip to Brookline, Massachusetts, a Boston suburb, that held both the offices of the American Society of Landscape Architects and Frederick Law Olmstead's firm, run by his two sons. Durham's express purpose was to hire someone to design Venice's town plan. While Olmstead's office did not design Venice, one of his apprentices did. It is obvious that the Venice plan owed much to the Chicago World's Columbian Exposition that had been built in 1893 on marshy land on the shore of Lake Michigan. Although Venice's plan was much more modest in scale, it was a planned community that separated the housing areas from its commercial and entertainment areas. Within a week of Durham's return with a preliminary plan, the Los Angeles Times' June 21st edition proclaimed that "Venice is said to be a sure go this time." 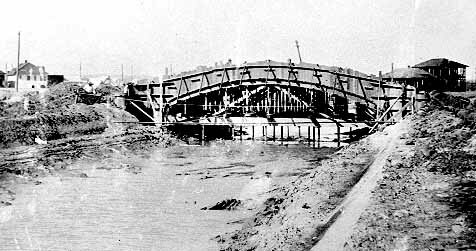 Kinney had signed contracts for excavating a canal network and for building a pier. Artist drawing of Kinney's new Venice of America seaside resort. The canal contract, awarded to a Long Beach contractor, called for the excavation of a 70 foot wide, four foot deep, half mile long main canal. It would be the first of a series of main and lateral canals totaling more than two miles. Work on removing 100,000 cubic yards of sand and soil began about July 1st. The other contract was for a 900 foot long, 30 foot wide pier to be located at the foot of Windward Avenue. In addition, Wadsworth won the contract for a 70 foot wide Ship Hotel also to be located on the pier. They ordered 600 piles from Northern California to arrive in time for a September start. Several weeks later Kinney hired Los Angeles architects Norman Marsh and Clarence Russell to design Venice's principal buildings. Both architects were familiar with the "City Beautiful" movement and understood Kinney's mandate that all building exteriors in the business district would be built in "Venetian Renaissance" style. Their model was Venice, Italy's Plaza San Marco, whose buildings featured enclosed colonnaded walkways. Building materials for the pier arrived by steamer on September 9th and were floated in with the tide to shore. Meanwhile as work progressed, the Los Angeles Pacific completed their Short Line to Venice that provided direct trolley service from downtown Los Angeles. 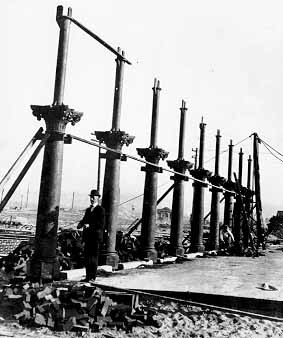 By October 6th, when pilings had been driven halfway, a spur was added to the pier to facilitate the transport of vast amounts of lumber needed to build the structure. Contracts for four Windward Avenue buildings were awarded to local contractors. Two of the buildings were for Kinney, one was for Dr. Hunt's hotel and the last was for Charles Wilson's hotel that faced the ocean front. The Independent Brick Company in Inglewood received an order for 2,000,000 bricks. 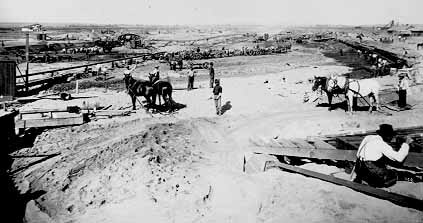 While property owners south of Venice planned to dig a two mile long canal to connect Kinney's canals to the Playa del Rey lagoon, Kinney couldn't rely on his competitors for a source of fresh salt water. Instead he hired Fremont Ackerman, a civil engineer specializing in irrigation canals. To assure a reliable source of fresh salt water, he decided to dig a 500 foot long conduit to the ocean and use two, thirty-six inch diameter pipes to supply the canals. Water would flow in and out, twice each day with the tides. The lagoon, the hub of Kinney's canal network at the eastern end of Windward Avenue, would serve as a huge outdoor swimming pool for 5000 bathers and would be eight feet deep in the center. By November Kinney had become dissatisfied with the contractor's performance in digging the canals. Five months had passed and they weren't even half way done with the first canal. The Hall Construction Company was hired in November to finish digging the entire canal network within a 120 day time frame. They launched their dredge on December 28th, but even its steam powered shovel had trouble digging through hard layers of blue clay. 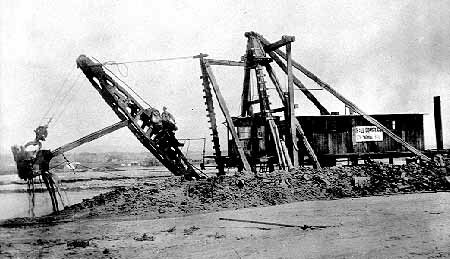 Canal excavation using a steam powered dredge. Concrete foundations for the 82 cast iron support columns for Windward's arcades were poured that week. Work couldn't proceed on the buildings until the iron columns arrived from the East on February 12th. Plans were unveiled for Kinney's Venice Bathhouse and a 2000 seat Amphitheater, both located on the lagoon. The first of a series of disastrous winter storms struck on February 4th. Although Kinney's pier only lost several pilings, the outer 400 feet of the Ocean Park Pier was lost. However, a second fierce on March 12th with waves three stories high, demolished his new pier, eroded the beach and flooded his construction site. Drifting piles from the demolished Ocean Park Pier. drifted south and acting like battering rams, broke its pilings like match sticks. Kinney's nearly completed Auditorium fell into the raging sea. By the following morning the pier was practically gone, and the beach was one vast pile of driftwood. Damage was estimated at $50,000. 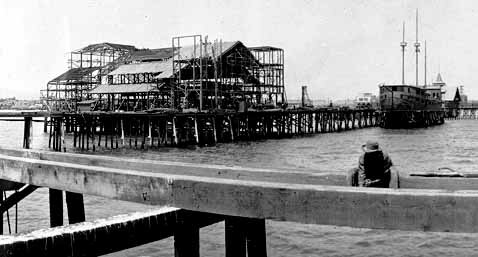 Rebuilding the pier became Kinney's highest priority since he had already contracted to hold the summer Venice Assembly in the pier's 3000 seat auditorium. He ordered four pile drivers rushed to Venice and purchased all 600 available pile at San Pedro. The U.S. government granted him the right to build a stone breakwater to protect his new pier. It would cost him an additional $100,000. During May, Kinney's army of workers, who worked long hours during day and night shifts, increased from 600 to 1000. Pier construction crews reached the site of the new breakwater (his pier was lengthened to 1200 feet) the first week of May. By the time they began framing the pier's auditorium on May 30th, they had only a month to complete the structure before the resort's July 4th grand opening. Season tickets for his sixty day Venice Assembly, a modern congress of Chautauqua ideals, art and modern thought; some 900 lectures on politics, philosophy, religion, economics and travel went on sale for $6.00. 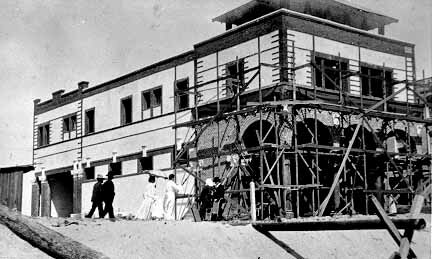 Construction of Windward's buildings progressed as carpenters framing the structures barely kept ahead of the bricklayers erecting outside walls. By mid-June it became apparent that many of the resort's buildings wouldn't be ready for the resort's grand opening. Fortunately the buildings closest to the beach were nearing completion, and so was the amphitheater at the lagoon where the swimming races would be held. But since accommodations were sparse for all the tourists expected to attend the Venice Assembly, Kinney erected a tent city along the banks of the Grand Canal. Finally on Friday, June 30th as an army of workers worked feverishly to complete Venice of America's attractions in time for the weekend's grand opening, workers stopped momentarily to witness an historic event. At 2 P.M. while the ocean tide was rising, Mrs. Kinney turned the valve on the pipes leading to the Pacific. Salt water, pouring in at a rate of 500 gallons a second, soon filled the swimming lagoon and two short canal segments. Coffer dams just beyond the lagoon, kept the area beyond dry as workers finished cementing the canal banks over the next two months. Scaffolding on Windward was temporarily removed for the grand opening celebration, and all the structures were decked with patriotic bunting. Workers strung flags across the street and tied potted plants to the columns of the arcaded walkways. Newspaper announcements proclaimed that everything was open and operating - well almost! To be honest the Lagoon Bathhouse wasn't ready for business because the heating plant hadn't been built, Coit hadn't finished his miniature railroad and the gondolas hadn't yet arrived from Italy. But the resort was ready for the 20,000 people who packed its streets, piers and beach each day of the four day celebration.